Since starting Support Suppers, I’ve become a lot more creative and adventurous in the kitchen. Perhaps it’s partly due to the utility of using what I have to make what I want without having to pay someone else to do it. But I’d say it’s mostly confidence to make proper adaptations and preparations to ensure a tasty outcome and make things efficiently without taking a lot of my time or making a huge mess. Recently at my Kindergarteners Parent Night, the teacher put out sign-up sheets for parents to volunteer to contribute certain things to the classroom parties throughout the year. The first party was the Halloween party and all of the traditional items were taken...even double-taken except for one...PUMPKIN PLAY DOUGH (cue the horror movie music). I’ll preface this by explaining that I wasn’t even allowed to play with play dough as a child, so I acknowledge the mess it can make but turn a blind eye to it on account of making my own childhood play dough dreams come true for my children. I asked the teacher what it was all about, thinking maybe I just had to pick-up some mini-packs at Costco. Nope, she had a “really easy” recipe to use real pumpkin (turns out just Pumpkin Pie Spice) to make homemade play dough for each child to explore the smell and texture of pumpkin at the classroom Halloween party. I was tempted to slowly back out of the classroom and run away, but how could I now. I cook for living for goodness sake, if anyone SHOULD sign-up to make pumpkin play dough, it probably should be me. I begrudgingly completed the party sign-up with a note to please send me the recipe. This past Friday, I discovered the recipe while cleaning out the little guy’s backpack and stuck it to the fridge. Today, we made it, and maybe it’s just my sense of adventure in the kitchen talking, but it was “really easy”, and really FUN! Within minutes of starting the project, my kindergartener discovered me and ran to grab his little apron to help. He is literally the worst eater but he loved smelling the dough while he helped me kneed it, cut it and roll it into 20 individual balls. “It smells like cinnamon,” he said with his sweet mispronunciation of the word cinnamon. There was one ball left over that he and his brother got to play with at the counter while I cleaned up. They played and created for almost an hour with that little ball of leftover dough. I’m not suggesting that everyone should try to make play dough, and I certainly don’t blame you if you don’t, but if you want the recipe shoot me an email at kate@supportsuppers.com. Despite knocking out all of this obligatory fall family fun we still found time to post our cooking dates and menus through the end of January 2019. Check out what’s cooking at supportsuppers.com as well as our Gift Meal option which makes a great holiday gift! Thank you for your Support and Happy Fall Y’all! We are back this week after another family week off this summer. This time around included even more family and friends and A LOT of windshield time. I am notorious for committing to a family road trip adventure and then almost instantly dreading it. Back in the spring when my husband said he was going to travel to the Cincinnati area for a party celebrating the 70th birthdays of two of his uncles, I didn’t even think twice about agreeing to pack up the car and drive there as a family. After all, isn’t that what summer is for? But, it included travel on a busy holiday week and the long road trip to Kentucky in April for spring break was still fresh in my mind. To make it easier on all of us we decided to break up the trip home by stopping to visit some of our old favorite places on the way back, driving a little bit each day until we were back in Richmond. Six nights, 4 cities, 4 different hotels...what a great idea (eye roll). Even though just the thought of it makes me feel exhausted, it actually was a pretty great idea. The birthday party was well attended by extended family that we hadn’t seen in years and probably won’t see again for many more. It was a hot day on a midwest lake and we all spent a chill day together floating, drinking, eating and celebrating. The next day we visited with my cousin and took the boys to the largest model train exhibit in the world to watch their little heads explode with excitement. We stopped in small towns we passed along the way and ate at our favorite spots in Columbus. 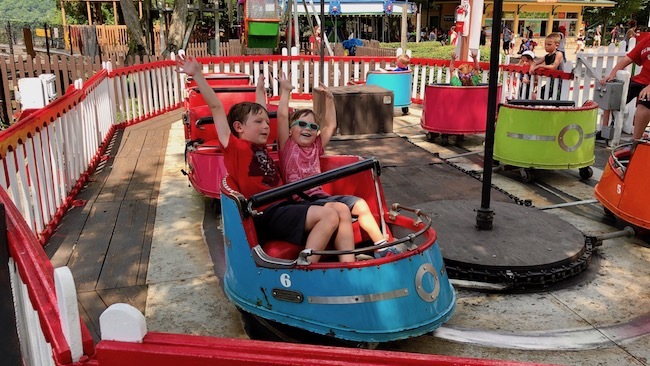 We visited my mother and sister in Pittsburgh and stayed for a day at Kennywood Park, which I swear has not changed at all in the 15 years or so since I’d been there last. On 4th of July, we started the day riding the inclines at Station Square in Pittsburgh and ended the day watching fireworks frame the Washington Monument on the National Mall. See what I mean...exhausting! But so much fun. We were greeted by friendly people everywhere we went and it reminded me of how much fun it can be to introduce the children to people and places that have made an impact on our lives. If you’re feeling up to a Great American Road Trip of your own, check out the link below for some ideas, I highly recommend #14! While I wish I was serving up some homemade pierogi and Primanti Bros.® sammiches to you all this week, we still have a great line-up scheduled. Check out what’s cooking and let us help you show some love and Support to your loved ones this week. Happy summer and thank you for your Support. In case you missed it, we’ve posted all of our Summer cooking dates and menus and you may have noticed that we are taking some time off this Summer. One week in each June, July, August we are not offering meals. One of those weeks is this coming week, although we will still be fulfilling all Gift Meal orders without interruption. This time we intend to spend with our families, celebrating milestones and making precious memories. So, you may be wondering why there is a picture of a bottle of bourbon for this post...or maybe if you’re from Virginia you’re just wondering why there is a Kroger® sticker on a bottle of liquor. 😉 I know I talk about bourbon a lot. I wouldn’t blame you for thinking I might have a drinking problem...I do but I don’t if you know what I mean. Because to me bourbon is more than just a super tasty beverage, it’s a tradition steeped in heritage and history with so many amazing stories to tell. Frankly, you just don’t get that from a bottle of SKYY® vodka, which is (fun fact) bottled at the Wild Turkey Bourbon® distillery we recently visited in Kentucky. My husband and I have been fortunate enough to learn about the history of bourbon during our family visits to Kentucky, but if you don’t have a chance to do that, I highly recommend you take a relaxing evening to rent and watch the documentary Neat: The Story of Bourbon. We know several people involved with the film and it is truly a work of art. One person they follow in the film is a third-generation employee from Buffalo Trace Distillery®. Near the end of the film, he tells a story of how he and his father received a very rare and special bottle of Pappy®. He, his father, and his brother share a drink together and he puts the lid back on the bottle when his father stops him and asks him what he’s doing. He explains to his father that this was a very special bottle of bourbon and that they should save it. His father disagrees and tells him that that bottle was made to share and be enjoyed. They spend the rest of the night finishing the bottle, sharing stories they never knew and making lasting memories. Within a year both his father and brother had passed away and the memories he made that night he’d cherish forever. When my husband and I recently celebrated our 10 year wedding anniversary, my mother-in-law traveled from Kentucky to watch the kids. With Summer ahead and my stock of my favorite bourbon, Buffalo Trace®, running low I asked her to pick up a bottle for us. When they arrived, I threw the bottle in our suitcase without even looking at it. It wasn’t until I unpacked at the hotel that I noticed the label. It was a special “Honey Barrel” single barrel run of my favorite bourbon. So rare and special that, just like the story above, I likely would have stashed it away and saved it for some distant special occasion. But it was all that I had and for goodness sake, it was a special occasion. A 10 year wedding anniversary and the first time my husband and I had ever spent a night away from the kids. We spent the weekend eating, drinking, relaxing and exploring the quiet towns around the Rappahannock River. We finished over half that bottle and I don’t regret it. The art, time and care put into making a bottle of bourbon is unmatched. Some of the most special bottles are aged so many years that the distillers that make them never get a chance to taste the finished product. Just like the love and relationships we form with others we encounter in our lifetime, each bottle has a story to tell and many will be shared while making lasting memories and celebrating special occasions. Thank you for giving me the opportunity to do what I love while also giving me the flexibility to spend time with my loved ones. We look forward to helping you Support one another this Summer. Cheers! This week is the beginning of a very exciting week in our family, Derby week! Not only a celebration of May and Spring, the Derby and thoroughbred horse racing is an event that can be enjoyed together by generations of families. It might be one of the few family activities that we can all get excited about going to, three generations having an equally amazing time. We often use visits to Kentucky to attend live races at Keeneland or Churchill Downs as a vacation from the Support Suppers responsibilities we share as a family. As you may know, my sister helps me with the cooking, cleaning, and deliveries after working at her teaching job, but my husband built and manages the website and creates our marketing materials during his evening free time. Even our boys help things run smoothly by patiently entertaining themselves during after-school deliveries and keeping quiet while I take phone calls or navigate taxes. So having an activity to share together and celebrate our hard work and patience is something I will always cherish. Soon we may not have to travel all the way to Kentucky to catch a great day of racing in the beautiful countryside. Check out this Richmond Times-Dispatch® article about the future plans for Colonial Downs® here in Central Virginia. We have a tasty week of menus ahead. Check out what’s cooking at supportsuppers.com and let us help make your week a little easier. Thank you for your Support and cheers to a lovely Derby weekend! Here’s hoping this weekend’s weather is here to stay. I also hope you had the chance to enjoy it celebrating Passover, Easter or maybe just Spring with your friends, family and loved ones. We’ll be enjoying some time with our families this week for Spring Break which means there are no meals on the calendar the first week in April. We do however have the menu calendars posted for the rest of April and May and will be fulfilling all Gift Meal orders throughout the week without any delays. We will also be available as usual via email, phone or webpage support to answer any questions you may have. If you don’t already, be sure to follow us on Facebook, Instagram, and Twitter to see what we have in store for our Spring Break adventures this week, and if you’re looking for some ideas for your own adventures, here are some great last-minute ideas right here in Virginia. Thanks for your Support and no fooling, I hope you have a great week, Spring Break or not. This time of year is always an exciting time in our household. 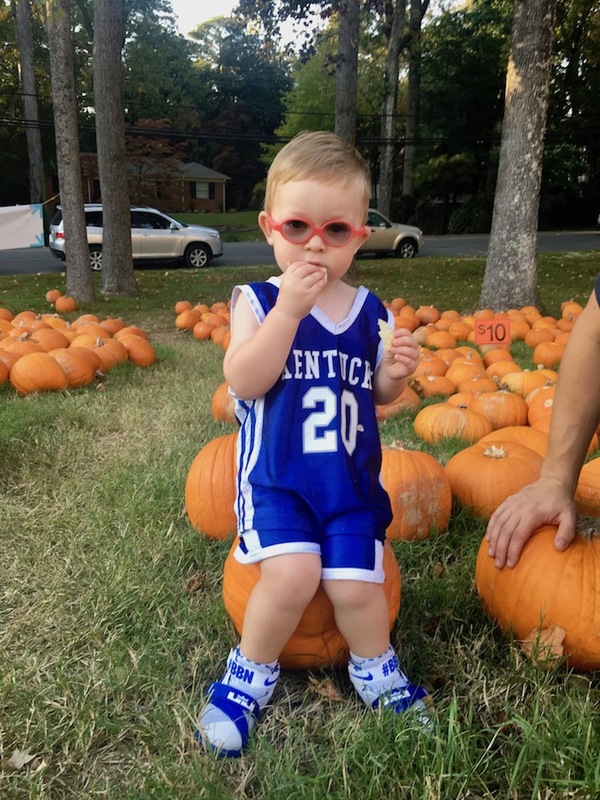 It’s not always easy being a Kentucky fan in the middle of ACC territory, but we keep our excitement in check. This year Virginia is the #1 overall seed in the NCAA tournament, and after a challenging year, Kentucky earned a #5 seed on the same side of the bracket as Virginia. For those of you unfamiliar with these terms and last weekend’s conference tournament results, that means that Virginia and Kentucky may meet in the Sweet 16 to play for a spot in the Elite 8. Y'all that’s an unfortunate potential match-up that early in the tournament. But no matter what happens, let’s have some fun with this. I heard on the news tonight that Warren Buffett has an employee bracket challenge for any employee that accurately predicts the Sweet 16 this year will win $1 million per year for the rest of their life, or $100,000 to the employee whose bracket stays intact the longest. I’m sorry to say that I am not Warren Buffett, but to save my reputation with some unforgiving Virginia fans, if Kentucky and Virginia meet in the Sweet 16 and Kentucky advances to the Elite 8, I’ll turn on a coupon code “SORRYFORYOURLOSS” at supportsuppers.com for $16 off any menu meal or Gift Meal purchase as many times as you want to use it for the entire week following the game to help you grieve the season with some delicious comfort food. We have a great menu lined up for this week, check out what’s cooking at supportsuppers.com and let us help you Support yourself or your loved ones with a delicious meal. Thanks for your Support and GO CATS! We missed the big snow this weekend for a trip to the West Virginia mountains to ride the Christmas train and celebrate the holiday a little early, but together with my husband’s family. It was simply magical. First, to see the kids and generations of family gather together in a small, remote cabin and just eat, drink and play together by the fire. And second, to see the small town of Cass, WV roll out the largest community welcome wagon I’ve ever witnessed to delight the generations of believers that literally scaled mountains to experience a little Christmas magic. We still did get to do a little sledding on Sunday, but not nearly as much snow as RVA got or the milder, windless temperatures our geography usually affords us. When we arrived home, there were stacks of Christmas cards and hand-delivered holiday goodies from our neighbors who didn’t let a little snow get in the way of their plans. This week is the last week to place orders for our Holiday Gifts, including the traditional Kentucky Bourbon Balls that I enjoyed this weekend with my husband’s family, as well as our Honey Butter, Jalapeño Ranch Dressing and Homemade Salsa in ready-to-gift mason jars. Otherwise, check out the great menu lineup for this week and our Gift Meals which make great holiday gifts for your local friends and family who could use a night off from cooking in the New Year. Thank you for your Support. The holidays are a very spirited time filled with family gatherings and traditions. However, it’s worth recognizing that this can be a tough time of year for so many people as those traditions serve as reminders of our loved ones lost. As usual, we’ve been waiting all year for the holiday model train exhibits and we hit the circuit right away visiting the Science Museum of Virginia the day after Thanksgiving and spending hours skipping from one train to another. My Dad came along with us and he was like a kid again seeing all of the equipment and making conversation with the exhibitors. One of them replied to him “...we’re all just big kids”. The holidays seem to bring out the kid in all of us. My Dad talked about the train he had as a kid and we told him about the train that we had in our basement that belonged to my husband’s Grandfather. The next day we set that train up on the dining room table and the kids were in awe. When I took a video of it and shared it with friends and family, so many people connected with it. That train connected too many generations to count. This holiday season I hope you can take the time to connect and share special traditions and no matter what reminder they hold, may they bring you peace and happiness. This week we’re serving some comforting classics. Check out what’s cooking as well as our Holiday Gifting offering and let us help you Support those special to you this holiday season. We are thankful for your Support. Today we enjoyed this beautiful day celebrating our littlest guys birthday with a big backyard birthday bash. Many of our family, neighbors, and friends gathered for a fun time but also to share in some delicious party food to celebrate. When we throw parties, I spend most of the weekend prepping the food that I know my friends and family love to eat, and some of the classic foods that bring us together. To me, there really is nothing better than coming together over a good meal. We use this same hallmark when we design our menus for Support Suppers. If it’s not something that feeds your heart and soul, then it doesn’t make the cut. Do you know what the most popular food at parties has been lately? Jalapeno Ranch! At Support Suppers, we serve it as salad dressing with our Mexican meals, but at parties we serve it alongside our homemade salsa with a bowl of tortilla chips. It’s addicting. This week we have two heart and soul warming menus to get you and your loved ones through the week. Check out what’s cooking as well as our Gift Meal option at supportsuppers.com. Many thanks for your Support!